Holiday lights are, by far, the most popular holiday decoration, adding sparkle and elegance to the season. Whether you use classic strings of lights, themed light displays or elaborate light dances, follow these important precautions when illuminating your home this year, both indoors and out, then sit back and enjoy the beauty of the season. Use only UL approved light strands, extension cords and replacement bulbs, and purchase them from reputable dealers and retailers. Use lights only in the manufacturer specified environment: indoor lights inside the home and outdoor lights outside the home. Examine previously used lights carefully. Repair or replace frayed wires and damaged sockets or discard worn lights and purchase new strands. Identify and replace all burned out bulbs (note: 2 burned out bulbs can shorten the remaining life of a light set by 39 percent, four bulbs by 63 percent). Use heavy-duty extension cords with no more than three strands of lights per cord. Carefully place extension cords to avoid tripping. Running cords against a wall is preferred. Indoors, extension cords should never be run under rugs or caught directly under furniture legs. Outdoor lights should be plugged into circuits protected by ground-fault circuit interrupters (GFCIs). A warm plug or wire and fuses that repeatedly blow means the circuit may be overloaded. Reduce the number of light stands to the circuit. Fasten strings of lights securely to tree trunks and branches, walls, posts, mailboxes and other structures. Outdoors, support and hang lights with plastic zip ties or insulated holders. Never use metal tacks, staples or nails. Do not string lights on metal structures or near standing water. Do not use light strands in nurseries, children’s play rooms or children’s bedrooms. Do not hang lights near main electrical and feeder lines. 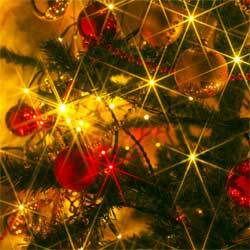 Indoors, only hang lights on a fresh tree or an artificial tree labeled as fire-resistant. String lights carefully so light strands and cords are not pinched in windows, doors or under furniture, which can damage the cord’s insulation and increase the risk of short circuits. Keep holiday lights on only during the evening hours and turn them off when you go to bed or leave the house. Cover unused outlets on light strands and extension cords with electrical tape or plastic caps to minimize the risk of short circuits or pets or children contacting a live circuit. Holiday lights are meant to be temporary. Take lights down when the season is over and store strands carefully for next year. With careful attention to safety, you can enjoy stunning holiday light displays for many joyous seasons to come.